Springvale’s biggest annual celebration Lunar New Year Festival is back on Sunday 3 February. 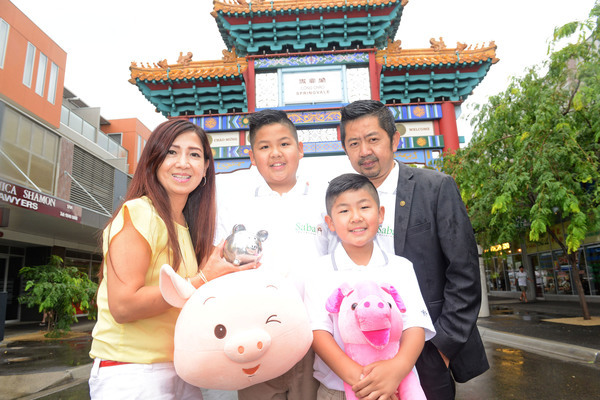 Regarded as the biggest such event outside Melbourne CBD, the festival in central Springvale will bring in the Year of the Pig in style. Organised by Springvale Asian Business Association (SABA) since 1992, the event has gone from strength to strength. “It’s a major event in the City of Greater Dandenong and Springvale,” SABA president Daniel Cheng said. “We’re expecting crowds of up to 90,000. It attracts people driving up to five hours to Springvale to attend the event. During the day, there will be three traditional lion dances – in the opening ceremony, 3pm and 8pm. The energetic dancers will be accompanied by rounds of fire-crackers to scare the bad spirits away for the new year. The opening ceremony runs 11am-1pm, including performances from Springvale Rise Primary School, a lion dance and live hip-hop dancing. Main stage entertainment is non-stop, including Cook Islander dancing, Japanese drumming, hip hop dancing, live bands, Chinese, Cambodian and Vietnamese dance and opera. Dozens of food stalls will serve cuisine from around the world. There will also be merchandise and sponsor stalls throughout the festival. At 9pm, the festival is rounded off with a fireworks display. Springvale is rich with Chinese, Vietnamese and Cambodian communities – each who celebrate the Lunar New Year. The vibrant festival however attracts “all different cultures”, Mr Cheng says. The event is the result of three months’ hard work and focus from SABA volunteers. It is also supported by City of Greater Dandenong and Victorian Multicultural Commission. Springvale Lunar New Year Festival is on Sunday 3 February 10am-10pm at Springvale shopping precinct, Buckingham, Windsor and Queens avenues, Springvale.